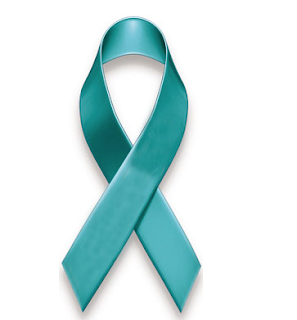 The Ovarian Cancer National Alliance, reports that each year in the United States, over 22,440 women are diagnosed with ovarian cancer. That means 1 in 75 women will develop ovarian cancer in her lifetime. More than 14,000 will die from it! I began researching this disease after finding the grave of Jane Todd Crawford in Sullivan County, Indiana several years ago. 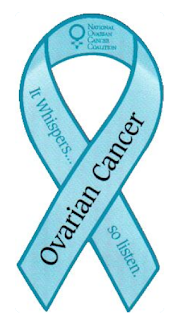 Jane was the first person to survive abdominal surgery – for a 22-pound ovarian tumor. It was December 1809 when Jane Todd Crawford became concerned about a pregnancy that was long overdue. At the age of 46, and as a mother of four, she knew something was wrong and that she needed medical attention. Jane wrote to Dr. Ephraim McDowell in Danville, Kentucky, explaining her condition. McDowell traveled to Green County, Kentucky and diagnosed a 22-pound ovarian tumor. He was interested in performing an experimental abdominal surgery that might save her life, but he warned her that so far the surgery had never been performed successfully. Knowing that her condition was fatal, Crawford agreed to allow Dr. McDowell to operate on her. It was a harsh December day when she set out on horseback from south of Greensburg to Danville, Kentucky, a journey of 60 miles. McDowell had refused to do the surgery anywhere but at his home where he had the necessary assistance and equipment available. The operation took place on Christmas Day in McDowell’s home. (McDowell hoped the church music and bells would diminish the sounds of Jane's agony.) Jane was strapped down to a table and given an oral dose of opium before being cut open. (Anesthesia did not exist yet.) Jane recited the Psalms while the operation took place. During the 25 minute procedure, McDowell removed a twenty-two pound tumor in two sections. This was the first successful abdominal surgery, and the first successful removal of an ovarian tumor, in the world! Crawford’s recovery was uneventful. She returned home at the end of January 1810. 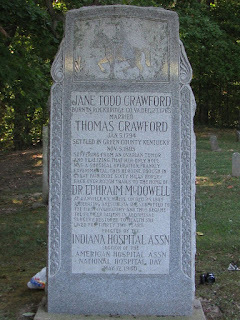 A few months later, the Crawford’s’ sold their land in Kentucky and moved to Indiana. 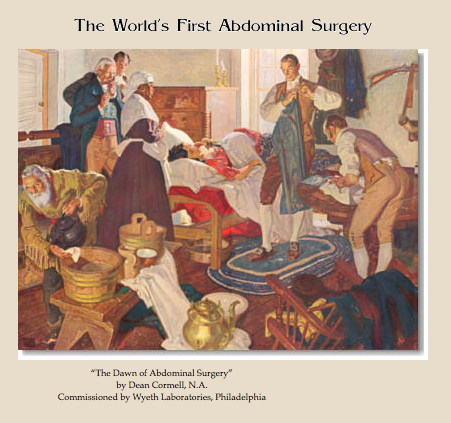 McDowell became famous as the pioneer of abdominal surgical techniques. 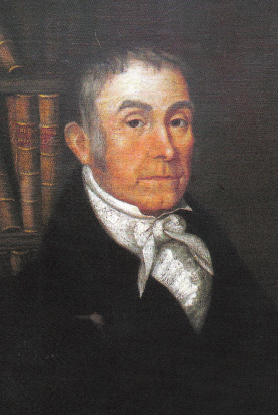 He performed the same operation on two more women within the next few years and published his report “Three Cases of Extirpation of Diseased Ovaria” in 1817. He continued practicing medicine until his death, ironically from an apparent appendicitis, on June 25, 1830. His home in Danville, where the operation took place, is now a museum and National Historic Landmark. Jane Todd Crawford died in 1842, at the age of 78, at her son’s home in Graysville, Indiana. 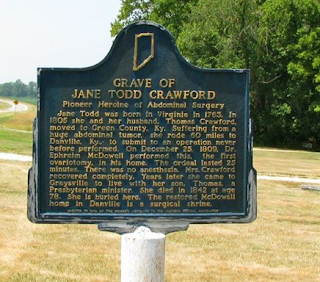 She is buried in the Johnson Cemetery, near Graysville, Indiana in Sullivan County. In 1871, the Women’s Auxiliary to the Southern Medical Association dedicated a stone for her grave. In 1940, the American Hospital Association placed a granite monument near her grave. Not only did Jane Todd Crawford make history as the first woman to survive ovarian surgery, she gave thousands of women hope concerning a disease that is slow, cruel, and still difficult to survive. I am currently working on a full-length play about Jane’s life. Keep apprised of how the work is going on Facebook at A Grave Interest’s page. 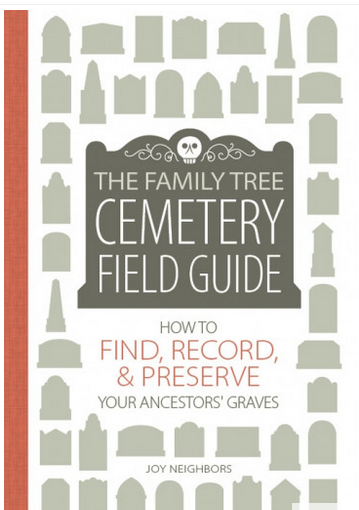 My first book, The Family Tree Cemetery Field Guide, will be out in bookstores nationwide the end of September. To order an advanced copy, visit Family Tree.